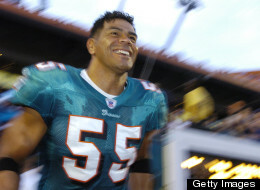 Junior Seau's brain will be donated by his family for research into football-related head injuries. San Diego Chargers chaplain Shawn Mitchell said he didn't know where the brain will be sent. "The Seau family really has, almost like Junior, a philanthropic approach, where they always desire to help others," Mitchell said in a phone interview Friday. "The purpose is not initially to discover anything about their son and what led to these tragic circumstances, but rather the betterment of other people and athletes down the road through anything that can be learned through the study." He said the family was not speculating as to whether concussions were a factor in Seau's suicide. Garrett Webster, the administrator and player liaison for the Brain Injury Research Institute, said his group has requested that the family donate the brain but hasn't heard back. "I don't want this to sound too crass, but we've sort of made our pitch," said Webster, the son of the late Hall of Fame center Mike Webster of the Pittsburgh Steelers. "We hope the family choses us, but the important thing is somebody's going to get it and it's going to get looked into. Junior Seau was a wonderful man and we're all aware of his work with charities. I wish it never happened. The important thing is, in some way, this will continue his legacy on giving back to the community and helping people." Officials at Boston University's Center for the Study of Traumatic Encephalopathy did not return calls from The Associated Press seeking comment Friday on whether researchers there had reached out to the Seau family. The Boston University center has analyzed the brains of dozens of former athletes, including that of former Chicago player Dave Duerson, who shot himself in the chest last year. Duerson's family has filed a wrongful death suit against the NFL, claiming the league didn't do enough to prevent or treat concussions that severely damaged Duerson's brain before he died in in February 2011. Another ex-player, former Atlanta Falcons safety Ray Easterling, who had joined in a concussion-related lawsuit against the league - one of dozens filed in the last year - shot himself last month at age 62. His wife has said he suffered from depression and dementia after taking years of hits.